An infographic is a visual representation of information. Infographics are commonly used in the business world to present and publicize company data. This free tool has six layouts to help you get started. You can insert your data into each of Infogr.am's pre-set boxes, or you can delete or add boxes. Choose from more than a dozen graphic options, add text boxes, photos, maps or even video. Finished infographics can be instantly shared though social media or use the embed code to place it on your own website. Piktochart starts with only three free themes but don't let that discourage you. Its customizable editor allows you to change color schemes, fonts, add basic shapes, pre-loaded graphics and your own, uploaded images. The template has grid lines to help you line items up evenly and resize images on the fly. For more customization options and 100 templates, you can upgrade to Piktochart Pro for $29 per month. With Easel.ly you start with one of a dozen free templates or begin with a blank canvas. You can remove any object on a template and replace it with modern graphics from 10 categories including people, transportation, animals and icons. There are also common shapes, connector lines and arrows. Upload your own graphics, clone and position graphics with a single touch, use the grid for a perfect layout and change the color of any item on the page. Customize the text with a collection of fonts, text styles, sizes and colors. The finished infographic can be downloaded or shared with a link or embed code. 1. What is an infographic? Communication Nation: What is an infographic? 2. Why do we use/ read infographics? Where do we see them in our world? Why do we have infographics? Infographic Labs: What is an Infographic? Each infographic is summarized in one sentence. 3. List the different types and parts of an infographic. This site has a list of categories of infographics on the right. Look at at least three examples to list different ways information is presented. The storyboard or the flow of your information in your infographic. What do you learn about the history of Mickey Mouse? What do you learn about the Coca Cola company? What facts do you learn about the Statue of Liberty? What do you learn about the history of barcodes? What facts do you learn about Long Island? 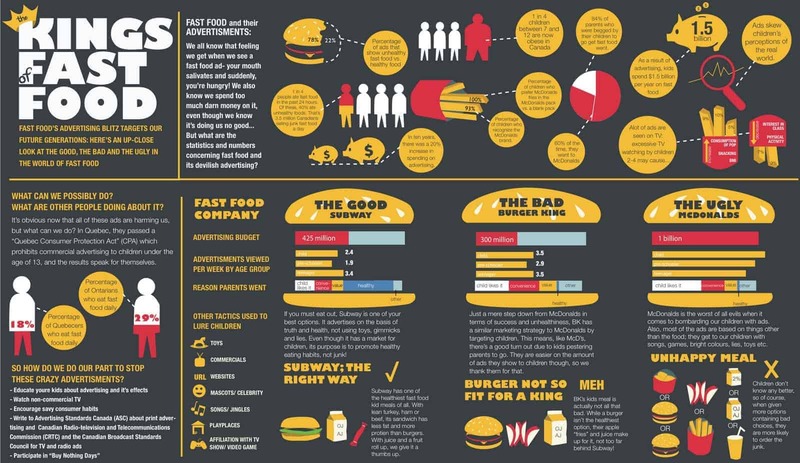 What do you learn about fast food?